I sometimes see mysterious sulfur lump in the vicinity area of crater I. Those lumps of sulfur seemed to be blown by the explosion at crater I but I wonder how this lump in the photograph were created. 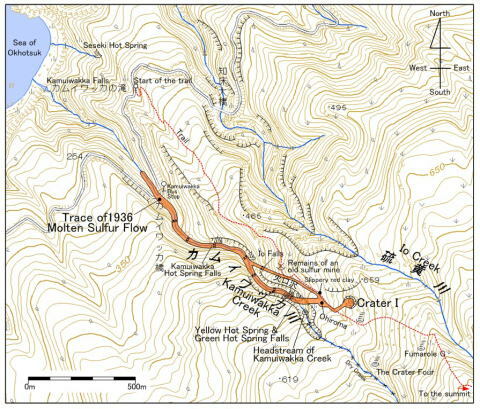 The documented molten sulfur flow is shown in the map above. But the sulfur lump in the photograph were observed just east of Crater I where its elevation is higher than Crater I. 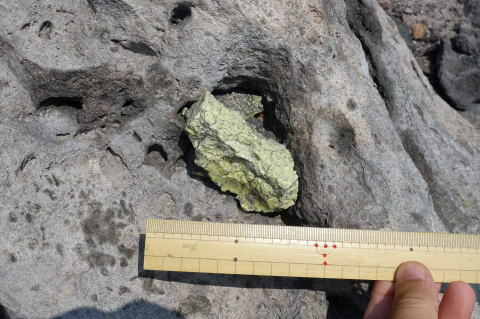 So the sulfur lump was blown by the explosion at Crater I. . Going back to the top page of this blog.